With our Monitored service you are responsible for the event setup and delivery of the event within the platform. The WorkCast support team can help you through this process; they can point you to the relevant Insite pages (including step-by-step guides) or help your directly. 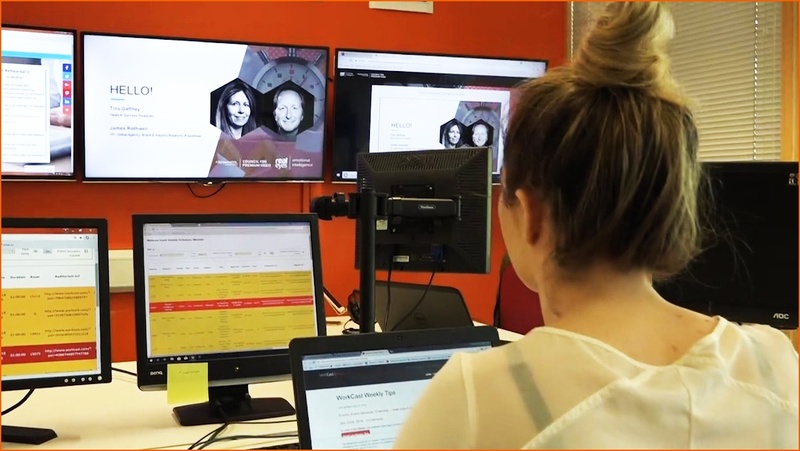 They will also provide support during your live event through our event monitoring station meaning you will be able to request help and guidance when you need it. However, you take ownership of the event and must make sure your presenters know what to do and how to do it. This service suits event managers who regularly run online events and know their way around the WorkCast platform. Our support is there to provide guidance and advice during your live event but, ultimately, you are in control of running your live webinar. Create your event using an event master template in your account which can be found in the "Create Events" section. If you have a monitored support licence then your event will be flagged by our event support team automatically (if you are unsure contact us at support@workcast.com). Use our event set-up guide to create and configure your event. You can upload a PowerPoint Presentation for your event to The WorkCast Platform. Presentation slides should be added as .pptx format - the platform does not accept PDF files. Embed all content and do NOT include hyperlinks. Prior to the event day it is worth ensuring you have planned a rehearsal with any presenters taking part in your live event to ensure everyone is aware of their role(s) during the broadcast. Ensure everyone has the correct login details. Test the audio options; presenters can either dial in or use a microphone connected to their device, or a webcam. Confirm who will be introducing the event? Who will be operating the slides? Who will be pushing out polls? Once you have added presenters to your event you can then send them their unique login details directly from the WorkCast Platform. Simply click the 'Email Login Details' button above the presenter information in your session, select the presenters you wish to email from the list and click 'Send Emails'. If you are using phone bridge audio, the dial in details are displayed to the top right of WorkCast Studio once you or your presenters have logged in successfully. Microphones or webcams can be connected using the Presenter Audio pod in the studio. The two key items to consider on the day of your event are your presenters and your audience. Below you will find our best practice guides. The WorkCast event delivery team will be online 30 minutes prior to the live event and will monitor for the event duration. You can contact and converse with them using the 'presenter chat' within the WorkCast Studio, via the Media Hub pod. WorkCast will let you know if all is running smoothly and if they see anything that a possible problem with your event they will advise you and take control where possible. Key examples of best practice: Ensure your presenters are using wired internet connections, landline telephones and use telephone headsets or handsets. View our Best Practice for Presenters PDF here. After your live event has taken place you have the option to make the recorded event available On Demand. Your media will update on your existing session once you have selected this from your event setup within the WorkCast platform. - Your event URLs stay exactly the same as your live event. The WorkCast Monitoring Station allows our support teams to review and monitor your event. Our Monitoring Team are constantly supervising all live events running on the platform and will proactively oversee the attendee experience, platform data and advanced analytics on attendee behaviour to spot any potential issues. This is all ran from our Monitoring Stations which uses multiple devices, networks and inputs to ensure events run as smoothly as possible. As well as this, we can also provide an event checking service which will include providing checks based on your event being set up using a Master Event Template. This check will be run approximately 24 hours before your live event (or the first working day before your event). The named platform user for your WorkCast account will receive an email with the results of this check. From then, the platform user will be responsible for completing any actions needed from the check.